Urban planting transformed into edible produce. Simple as that, although of course the ripples of this simple and brilliant idea go far beyond. 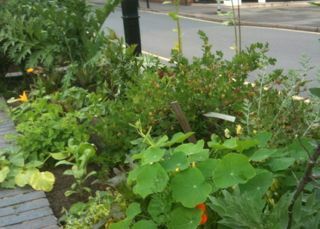 Wilmslow in North Cheshire is host to one of the Incredible Edible projects. 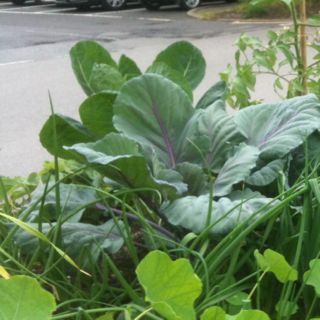 Public growing spaces around the town are bursting with edible produce. I took a few pictures the other day of some of the spaces. Strawberries, onions, beans, gooseberries, oregano and garlic are all flourishing. Everything grown is available for anyone to enjoy – when I was there, two or three people picked some strawberries and herbs as they were passing. The Incredible Edible project began in Todmorden, West Yorkshire, by a small, inspired group and is now spreading across the country. I think it’s a genius initiative, especially when as a culture we are becoming more and more remote from the sources of our food. Anyone can help out (it’s all managed by volunteers), and everyone benefits. A community initiative that is genuinely and wonderfully accessible. Posted on July 16, 2014 by Sarah at Seasoning Works. This entry was posted in herbs, Incredible Edible, Real Food Campaign. Bookmark the permalink.